Google has just announced its take on the 2-in-1 productivity tablet: the Google Pixel Slate. The tablet is priced like that of other flagship tablets of this ilk, but with the performance profile of any old Chromebook to start. So, how does Pixel Slate stand up against a leading competitor? To answer that question, we’re looking at the 12.9-inch iPad Pro, which is a similar size and not much more expensive to start. Not to mention that it, too, uses an operating system (OS) that has only recently come up to speed with the demands of mobile professionals. So, should you buy a Google Pixel Slate in the face of an iPad Pro? Sadly, it’s never quite that simple. Both the iPad Pro and Pixel Slate are very similar in design. They’re both basically like any other tablet, with smoothed aluminum casings and fingerprint readers for security. However, both designs have their benefits and flaws. The Pixel Slate, for instance, uses front-firing speakers and sports not one, but two USB-C ports. However, it’s lacking a headphone jack and its screen slides against the official keyboard cover. Meanwhile, the iPad Pro has a gorgeous display and an ironclad OS for security purposes, but it also doesn’t support mouse or touchpad and it has a single Lightning port. 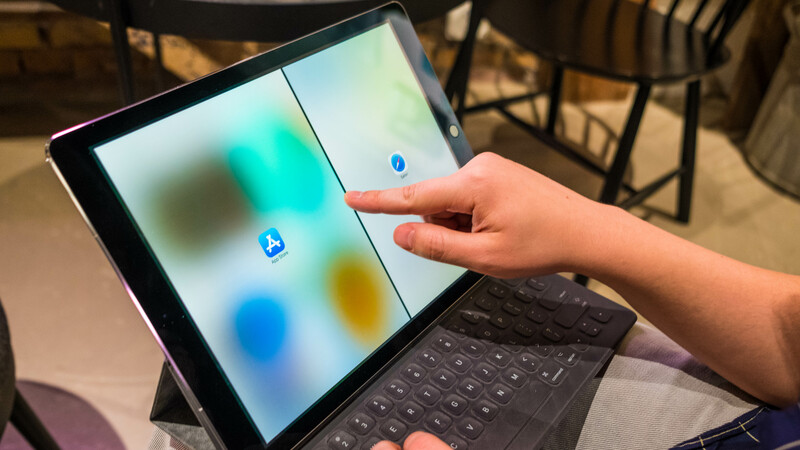 All said, we’re preferring the iPad’s Smart Keyboard to the Pixel Slate’s Keyboard, on account of its feedback and travel as well as how it connects with the device. The Pixel Slate uses a similar proprietary method to all the rest with magnetized pins, but the screen seems to slide all over the display when in this use case. Ultimately, both Google and Apple are killing it when it comes to straight product design, and we’d gladly use either as a straight tablet. It’s when you introduce the accessories that things begin to diverge, and in this case for the better regarding the iPad Pro – and it doesn’t even have a touchpad. When comparing displays, it’s important to get the brass tacks out of the way first: the 12.9-inch iPad Pro display is one of Apple’s True Tone displays with ProMotion technology for easier viewing. Meanwhile, the 12.3-inch Pixel Slate is what Google calls a ‘Molecular Display,’ which applies physics to drawing out more pixels per inch out of low-temperature polymer crystals that move electrons faster than standard displays. Ultimately, this means that the Google Pixel Slate display is actually sharper than the 12.9-inch iPad Pro at 293 pixels per inch (ppi) and 264 ppi, respectively. Of course, this isn’t exactly apples to apples, as one display is larger than the other and therefore affects those calculations. This might not mean a ton in straight day-to-day tasks, but games and videos may look a little sharper on Pixel Slate than iPad Pro. That said, the iPad Pro uses the industry-grade P3 color gamut, which is a popular feature with digital creators. 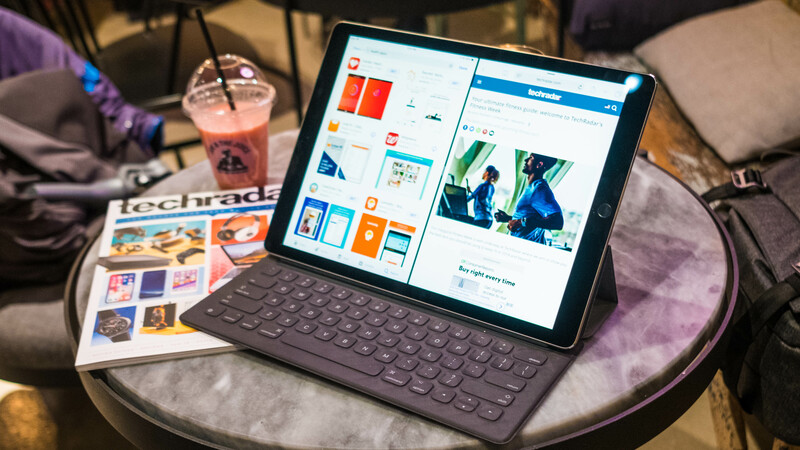 Ultimately, we find the iPad Pro’s to be a more impressive display with features that should please a wider swathe of users. This is where things get interesting – and, before we get into it, we’re only comparing the basic Google Pixel Slate configuration against the base level iPad Pro. The Pixel Slate calls for $599 (about £459, AU$847) before asking for another $199 (about £152, AU$281) for the Pixel Slate Keyboard cover. This gets you an Intel Celeron processor that’s still unnamed, 4GB of memory and a 32GB solid-state drive (SSD) inside to power the experience. Meanwhile, the iPad Pro 12.9 calls for $799 (£769, AU$1,199), and another $169 (about £169, AU$245) for the Smart Keyboard cover. For that price, you get an Apple A10X Fusion processor, 4GB of memory and a 64GB flash storage drive inside. So, at the entry level, you’re looking at an $800 purchase for the (almost – we’re not counting the stylus) complete Google Pixel Slate experience at the ground level, whereas the iPad Pro gets you there at a whopping $970. Both are mighty expensive, but we’re willing to wager that the iPad Pro is more powerful than the base-level Pixel Slate. That might even out as you dig into more powerful Pixel Slate configurations all the way up to Intel Core i7 processors, but at what cost? On the other hand, the iPad Pro iOS operating system simply doesn’t compare to what the Pixel Slate is capable with the now-enhanced Chrome OS. So, the iPad Pro may be more powerful on paper, but the Pixel Slate is more immediately useable in a productivity setting. So, if you have a specific use case that both the iPad Pro and Pixel Slate can enable, then you might be best served by the iPad Pro in this situation. However, if your use case changes regularly and you’re looking for more generalized productivity, the Pixel Slate may have the advantage. Generally speaking, the Pixel Slate is actually rather comparable with the iPad Pro, but perhaps for different reasons than you might expect. The Pixel Slate may not pack as much raw power at the onset, but it’s immediately more versatile and flexible than an iPad Pro. 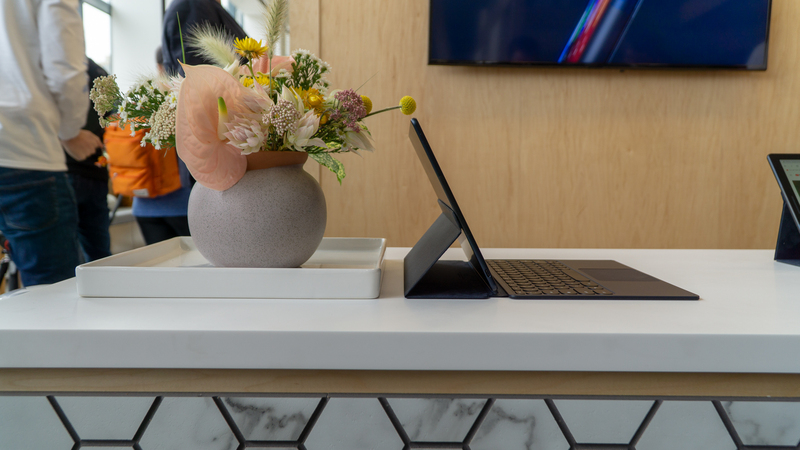 However, when it comes to Pixel Slate, we could easily think up similarly priced solutions that are just as versatile and flexible while being much more powerful, like the Microsoft Surface Pro. At any rate, the iPad Pro wins out against the Pixel Slate when the primary use case lines up with the Apple tablet’s capabilities, primarily digital art creation and editing. 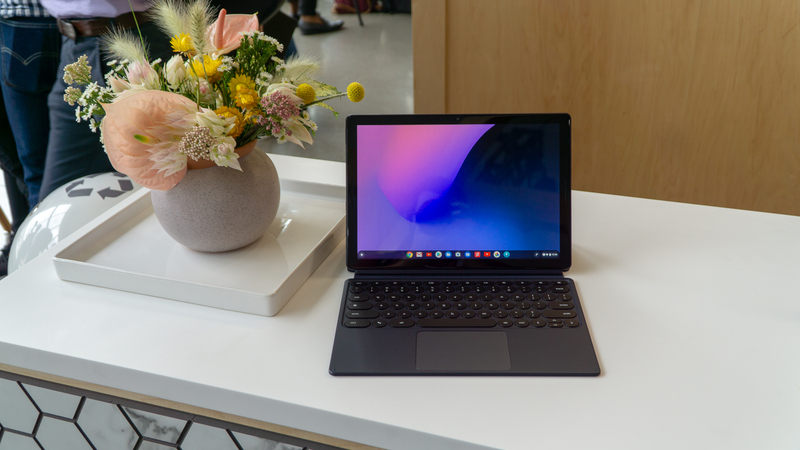 But, if you’re looking at these two tablets and have more general computing needs, then Pixel Slate is your best bet.